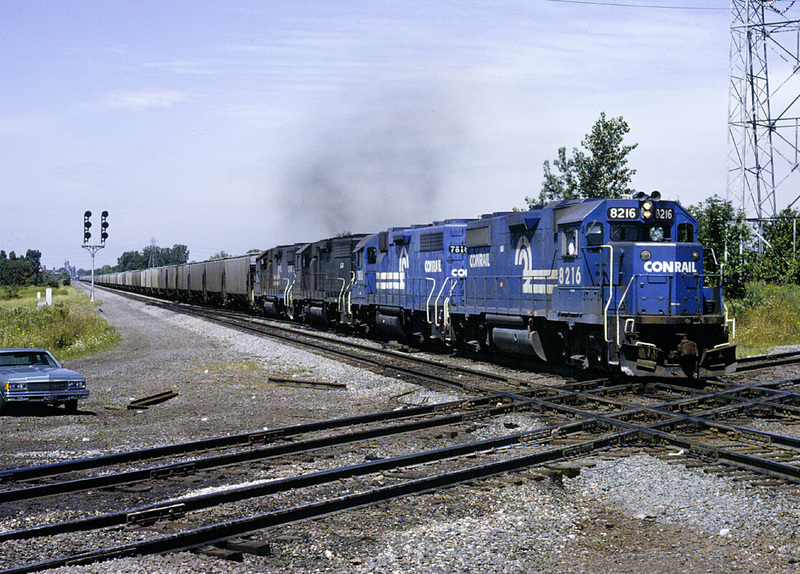 An eastbound Conrail grain train hits the diamonds at Vickers Crossing in Northwood, Ohio on 24 August 1982. I obtained my driver’s license in the summer of 1982, and it was time to start railfanning! My parents would go to Toledo for shopping most weekends, and soon I was able to talk them into letting me drop them off at a mall for shopping, and letting me have the car for 1–2 hours to go take pictures! One of the first railfanning points I learned about in Toledo was Vickers Crossing, in the southeast suburb of Norwood, where Conrail’s Toledo-Cleveland main line crossed the eastern side of the Toledo Terminal Railroad. It was a good place to see some train action in the limited time I had use of the car. Look at this summer day in 1982—beautiful morning sun, and an eastbound Conrail grain train led by four units, one of them still in PC black! There’s my parents’ 1977 Chevy Caprice Classic on the left, which would later become my first car. In this era before the rabid worry about trespassing and liability shown by railroads today, you could drive down to the diamond and park and wait for something to come along. Today this is a no-go zone, with a very much changed landscape, both in terms of topography and the railroads running through here.